When I was growing up, we had a babysitter named Karen for a short time. I always looked forward to her coming over. 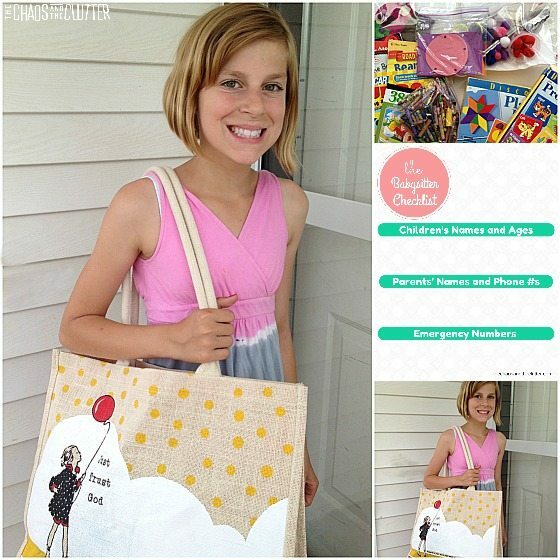 She would bring a babysitting bag with her, much like the one that Mary Poppins carried, full of all sorts of magic. She would pull out of her babysitting kit all kinds of crafts and activities for us to do and it seemed like no time at all until my mom was back home and Karen had to leave and take her bag of fun with her. When I started babysitting for my neighbour’s three little ones, I had been so influenced by Karen that I packed a babysitting activities bag of toys and games to bring for them and they waited expectantly to see what treasures were in store for them. Our kids have been fortunate enough to have a babysitter who brings special treats and activities for them as well. Rachel is a wonderful babysitter and her bag of goodies only adds to the fun. The kids always look forward to her coming over. Earlier this year, our daughter Miss Optimism took her babysitter course and is now officially old enough to babysit. 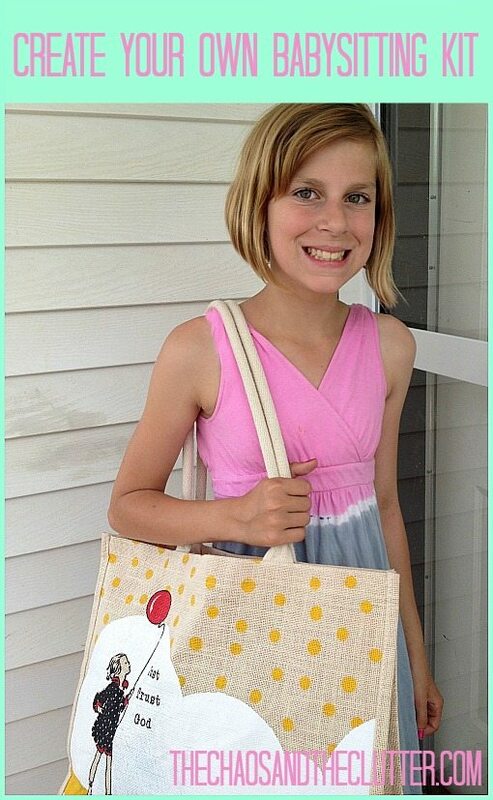 She has created a babysitting bag for herself that she brings with her when she goes to the two families that she sits for. The kids at both homes look forward to her coming and finding out what babysitting games they can play. Creating a babysitting kit is not complicated. It helps both, the children being babysat, the parents of those kids, and the babysitter. It helps create better safety as the kids are likely being more closely supervised during those babysitting games. It makes the time pass more quickly for the kids and babysitter, it makes the time easier on the babysitter, and it cuts down on behaviour issues. 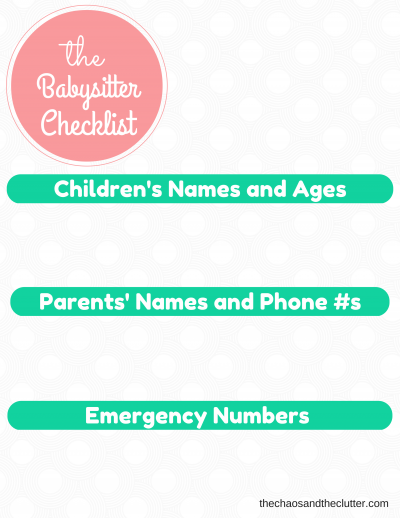 I’ve made a simple printable for you to include in the kit, The Babysitter Checklist. You can put the two pages back-to-back into a plastic sleeve and use a dry erase marker to update the information. 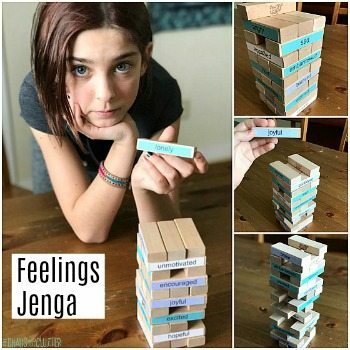 good quality toys – when I was babysitting, I would often bring Marbleworks along with my kit and it’s the exact same Marbleworks that my kids still play with! It’s a nice one because kids of many different ages can all enjoy it together. The thing that kids look most forward to playing with in my daughter’s babysitting kit is the busy bags. I think the main reason for this is that it is something novel and new for them. They are great for the babysitter as well as they really help keep kids productive and busy and they are wonderful tools for learning colours, numbers, shapes, letters, patterns, and reading. 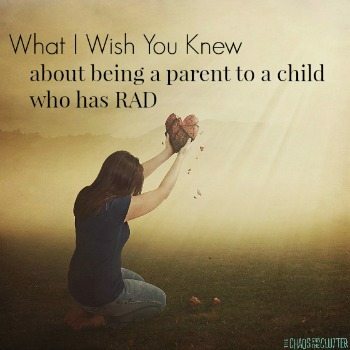 This aspect of them will really be appreciated by the parents! Here’s a sample of some of the fun babysitting activities that go in my daughter Miss Optimism’s babysitter kit. She will swap out the busy bags most times so that she is always bringing fresh things and she changes the books and puzzles depending on the ages and interests of the kids she’s babysitting. Helping your child to create a babysitting kit when they first start as a babysitter will help them to feel more professional and confident. It will also help them to stand out from other sitters and do the best job possible. While creating the kit, I would suggest taking the chance to talk about other responsibilities and safety measures for when they are babysitting. I know that nowadays, it can be very difficult to get a babysitter and parents don’t have high expectations, but I believe in teaching my kids to work hard and go above and beyond. Babysitting will be the first job many kids have and the habits they form there will help shape their future work habits. being on time means being early (this also gives the parents time to explain their expectations and the routine). leave the house cleaner than you found it. the kids and their safety come first, but if they are sleeping, tidy up or try to bless the family by finding ways to help. call your own parent if a behaviour issue arises and you don’t know how to handle it. children are precious and caring for them is a big responsibility. do things in such a way that you will feel proud of yourself. you are an example to the children you are watching so be a good role model. 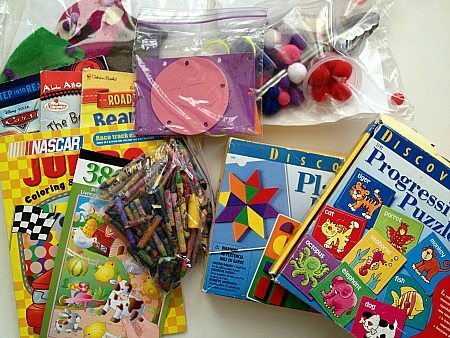 If you are looking for more fun babysitting activities to include in your babysitter kit, check out all of our busy bag ideas. 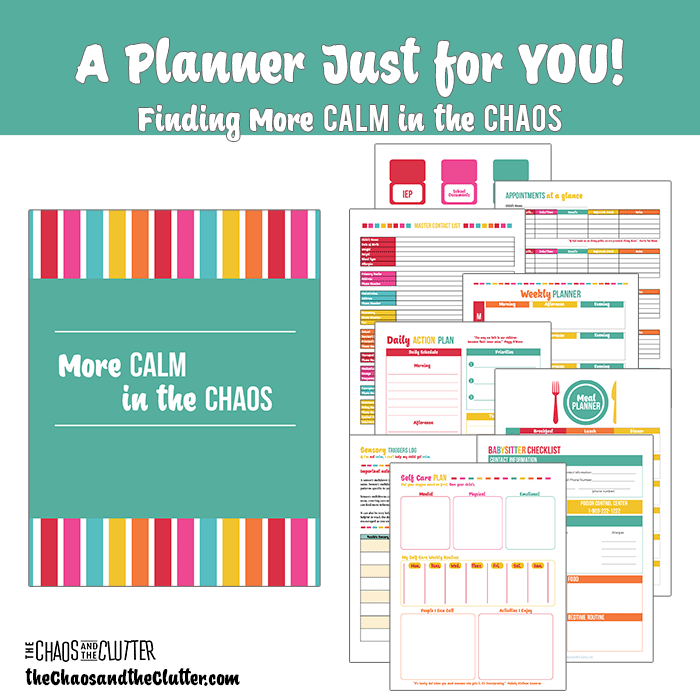 There is also a more detailed Babysitter Checklist included in our More Calm in the Chaos Printable Planners for Moms. I love this! When I used to babysit, I had an old suitcase that I’d bring with me full of activities. I’d almost forgotten about that! And I love the tips! I love this!!! And it so brings me back to my obsession with The Babysitter’s Club book series as a child. I had my own babysitting kit too! 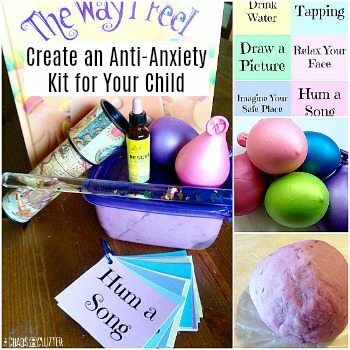 I love the idea of a baby sitters kit! I use to be a sitter when I was a teenager to earn some pocket money and there was one family I used to go sit for where the kids had no colouring crayons or paper so I used to take some along and they would just sit and be creative – and quiet! This is so awesome! I wish every baby sitter came with a babysitter bag. Seriously. I hate it when I pay for a babysitter and they sit around watching movies or playing games on the sitter’s phone. I just think it’s not as fun or as exciting as something like this! Love it! Thanks for sharing with HDYDI! Great post – I used to have my own kit too. Your daughter looks so young to be baby-sitting though! She’s really tiny for her age but she is actually 12 and a half. She’s the size of an average 9 year old though! I love your ideas and the standards you share! Thank you so much for stopping by this week’s Thoughtful Spot! Such a wonderful resource! I love it! Thank you for sharing at Sharing Saturday!! Awesome post! This reminds me of the kid kits from the Babysitters Club books. I’m pinning this for when my daughter is old enough to babysit. Sharing on Facebook too! Thanks for sharing at After School. I think the checklist is a great idea but, I wouldn’t put it in a plastic sleeve. Instead print one out for each new family you sit and have them fill it out. That way, you always have it with you and they don’t have to keep filling it out. Just a thought from a babysitter with 3 years experience! I am a young babysitter and these tips were so helpful. And yeah, that’s all I got.